Oh, no! Is the urban revival really over? Richard Florida’s op-ed piece in The New York Times last week had an eye-catching headline: “The Urban Revival is Over.” Here was the apostle of cities, apparently calling and end to the bull market for urban living. Second, let us push back on some of the arguments advanced about cities. As we’ve noted time and again, looking to changes in municipal population totals is an unreliable guide to judging the growth or decline of of dense, urban neighborhoods. Many expansive municipalities (Chicago, Phoenix, Jacksonville) take in neighborhoods that would usually be thought of as suburban (i.e. tracts of lower density, single-family auto-oriented development). As is the case in places like Chicago, the densest, close-in urban neighborhoods continue to add population at fast clip, while older more distant neighborhoods continue to shed population. It’s also worth noting that despite the slowdown in population growth in cities relative to their suburbs, that’s only in comparison to the recent very strong performance by cities. After decades of decline (in the 70s, 80s and 90s), cities are doing better in terms of both job and population growth (even if, in the aggregate, they’re not outpacing suburbs anymore). Consider this analysis of county-level data from Jed Kolko; the densest urban counties aren’t wildly out-performing less dense suburban ones as they did a few years ago; but they are growing consistently faster than they did in previous decades. Meanwhile, the least dense counties aren’t growing as fast at they did in the last boom. 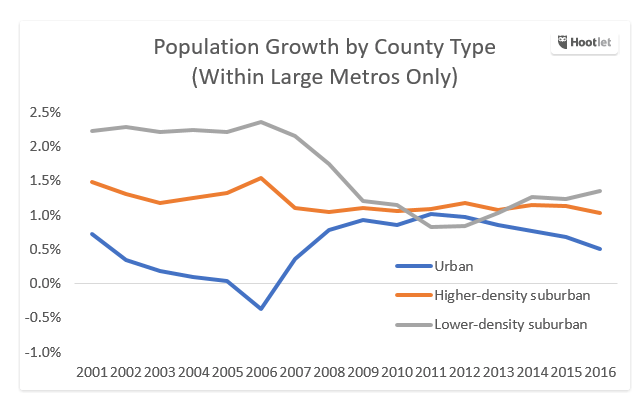 We think counties are far from the ideal geography to measure urbanism, but urban counties were losing population a decade ago; and though they’ve slowed, they’re still growing today. So the problem isn’t so much that the era of the city has ended, but rather that we’ve hit the point at which future increases in city populations will depend on local governments accommodating the growing demand for urban living. Even in the best of circumstances, in accommodative jurisdictions like Seattle, this process takes time, and there’s invariably a lag between market demand, a rise in rents, the recognition of development opportunities, obtaining finance and needed permits and actually building new housing. There are signs that in some cities, supply is starting to catch up. But in other places where NIMBYism has a stronger hold, the land use planning process still constrains the growth of cities. This is true in some of the most desirable urban markets (New York, San Francisco). At least one part of Florida’s argument for a bust in the market for city living strikes us as flat out wrong: Crime. Florida notes that murder rates have ticked up in a handful of cities (Baltimore, St. Louis, Milwaukee). But that’s scant evidence for a claim that crime is “foremost” among the factors stymying the urban revival. The long term trend in urban crime has been downward for more than two decades, with the result that crime in most large cities is now half what it was in the 1990s. 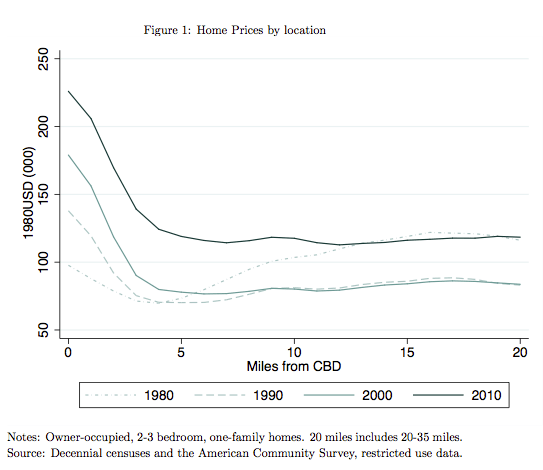 And if the crime argument made any sense, it ought to be accompanied by falling demand for urban living and declining rents (something we observed in cities when crime was a growing problem in the 1950s and 1960s). The crime conjecture is simply at odds with the steady growth in urban home values and rents we see in cities around the country. Rather that proclaiming the end of the urban revival, Florida’s evidence really makes the case for a renewed national commitment to building more great urban neighborhoods. Surely, as Florida suggests, the urban revival is fragile. It depends heavily on overcoming many of the institutional and policy biases that work against the growth and development of great cities.